On 20th June, the first General assembly of the NAVAIS project was organised in Rotterdam with attendance from all 16 partners participating in the project. During the General Assembly meeting the consortium partners discussed the technical outline of the modular design and construction concept, which the NAVAIS project is about to develop. Several presentation were held about project outlines in corresponding Working Packages, with special focus on the planning of the work to be done. On the following day, a series of workshops was held at Damen Gorinchem to investigate the mutual interdependencies between the working groups and to align the efforts during the first six months, leading up to the second General Assembly, scheduled for November 20th in Velizy. 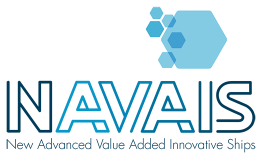 MARIN is one of the participating partners in the NAVAIS project. For more information see www.navais.eu.